The Italian-Mediterranean restaurant located in English Village is hosting the event that will benefit the Greater Birmingham Humane Society and feature themed, specialty craft cocktails for animal lovers. The GBHS will have adoptable dogs at the event, but guests will not be able to adopt dogs on-site. Guests are also invited to bring their furry friends. There will be opportunities to win prizes like gift cards or toys and treats for your pets. 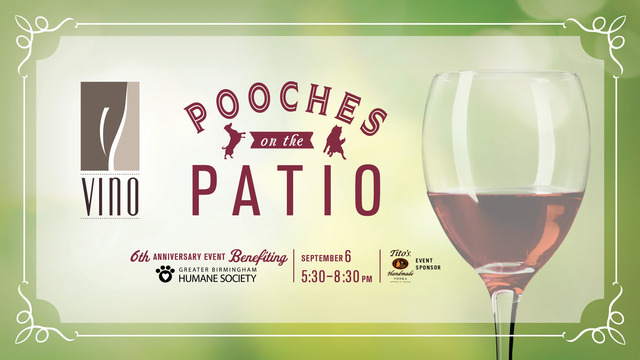 Pooches on the Patio will be on Wednesday, September 6th from 5:30 p.m. – 8:30 p.m. Event organizers encourage guests to make reservations in advance to attend. To learn more about Pooches on the Patio, visit the Vino Facebook page. To make reservations, visit the Vino website here. To learn more about the Greater Birmingham Humane Society, visit their website here.